Azure Database for MySQL is a managed service that enables you to run, manage, and scale highly available MySQL databases in the cloud. Using the Azure portal, you can easily manage your server and design a database. If you don't have an Azure subscription, create a free Azure account before you begin. Open your favorite web browser, and visit the Microsoft Azure portal. Enter your credentials to sign in to the portal. The default view is your service dashboard. An Azure Database for MySQL server is created with a defined set of compute and storage resources. The server is created within an Azure resource group. 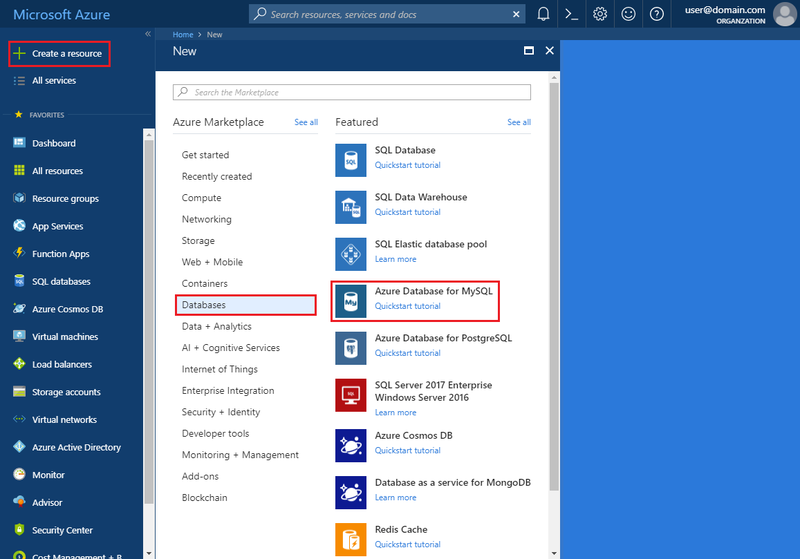 Navigate to Databases > Azure Database for MySQL. If you cannot find MySQL Server under Databases category, click See all to show all available database services. You can also type Azure Database for MySQL in the search box to quickly find the service. Click Azure Database for MySQL tile, and then click Create. Fill out the Azure Database for MySQL form. Server name Unique server name Choose a unique name that identifies your Azure Database for MySQL server. For example, mydemoserver. The domain name .mysql.database.azure.com is appended to the server name you provide. The server name can contain only lowercase letters, numbers, and the hyphen (-) character. It must contain from 3 to 63 characters. Subscription Your subscription Select the Azure subscription that you want to use for your server. If you have multiple subscriptions, choose the subscription in which you get billed for the resource. Resource group myresourcegroup Provide a new or existing resource group name. Select source Blank Select Blank to create a new server from scratch. 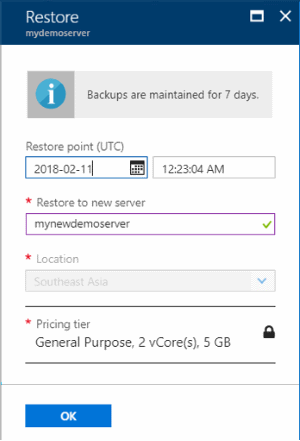 (You select Backup if you are creating a server from a geo-backup of an existing Azure Database for MySQL server). Server admin login myadmin A sign-in account to use when you're connecting to the server. The admin sign-in name cannot be azure_superuser, admin, administrator, root, guest, or public. Password Your choice Provide a new password for the server admin account. It must contain from 8 to 128 characters. Your password must contain characters from three of the following categories: English uppercase letters, English lowercase letters, numbers (0-9), and non-alphanumeric characters (!, $, #, %, and so on). Confirm password Your choice Confirm the admin account password. Location The region closest to your users Choose the location that is closest to your users or your other Azure applications. Version The latest version The latest version (unless you have specific requirements that require another version). Pricing tier General Purpose, Gen 5, 2 vCores, 5 GB, 7 days, Geographically Redundant The compute, storage, and backup configurations for your new server. Select Pricing tier. Next, select the General Purpose tab. Gen 5, 2 vCores, 5 GB, and 7 days are the default values for Compute Generation, vCore, Storage, and Backup Retention Period. You can leave those sliders as is. To enable your server backups in geo-redundant storage, select Geographically Redundant from the Backup Redundancy Options. To save this pricing tier selection, select OK. The next screenshot captures these selections. Click Create. In a minute or two, a new Azure Database for MySQL server is running in the cloud. You can click Notifications button on the toolbar to monitor the deployment process. Azure Databases for MySQL are protected by a firewall. By default, all connections to the server and the databases inside the server are rejected. 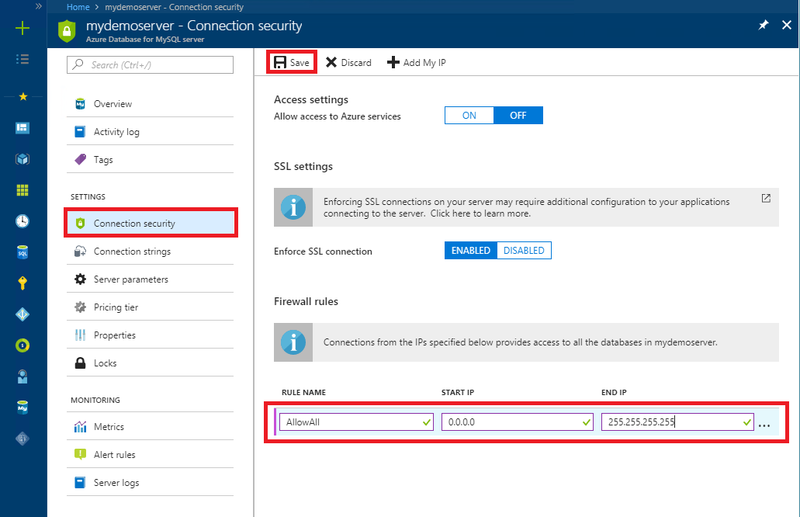 Before connecting to Azure Database for MySQL for the first time, configure the firewall to add the client machine's public network IP address (or IP address range). Click your newly created server, and then click Connection security. You can Add My IP, or configure firewall rules here. Remember to click Save after you have created the rules. You can now connect to the server using mysql command-line tool or MySQL Workbench GUI tool. Azure Database for MySQL server communicates over port 3306. If you are trying to connect from within a corporate network, outbound traffic over port 3306 may not be allowed by your network's firewall. If so, you cannot connect to Azure MySQL server unless your IT department opens port 3306. Get the fully qualified Server name and Server admin login name for your Azure Database for MySQL server from the Azure portal. You use the fully qualified server name to connect to your server using mysql command-line tool. In Azure portal, click All resources from the left-hand menu, type the name, and search for your Azure Database for MySQL server. Select the server name to view the details. From the Overview page, note down Server Name and Server admin login name. You may click the copy button next to each field to copy to the clipboard. In this example, the server name is mydemoserver.mysql.database.azure.com, and the server admin login is myadmin@mydemoserver. 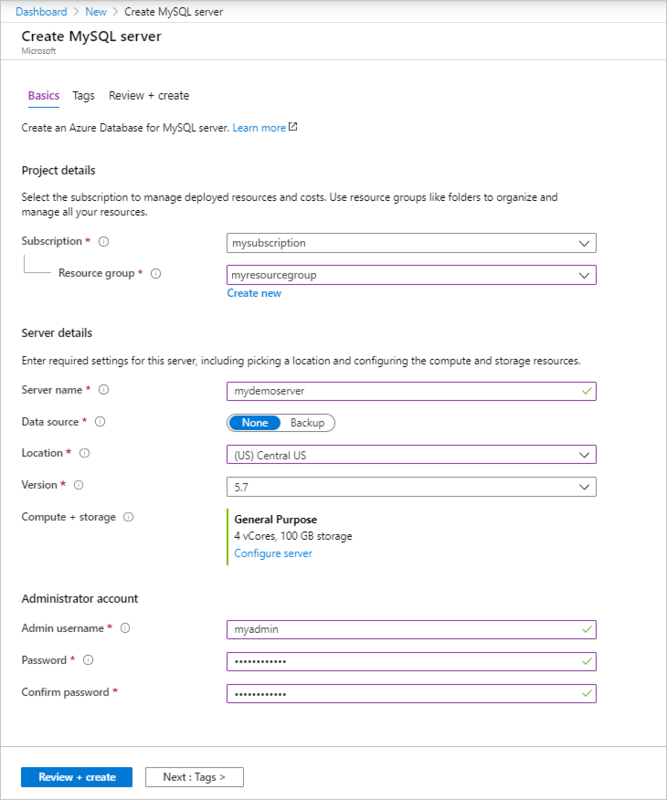 Use mysql command-line tool to establish a connection to your Azure Database for MySQL server. You can run the mysql command-line tool from the Azure Cloud Shell in the browser or from your own machine using mysql tools installed locally. To launch the Azure Cloud Shell, click the Try It button on a code block in this article, or visit the Azure portal and click the >_ icon in the top right toolbar. Once you’re connected to the server, create a blank database to work with. First, create a table and load it with some data. Let's create a table that stores inventory information. Now that you have a table, insert some data into it. At the open command prompt window, run the following query to insert some rows of data. Now you have two rows of sample data into the table you created earlier. Execute the following query to retrieve information from the database table. You can also update the data in the tables. The row gets updated accordingly when you retrieve data. Imagine you have accidentally deleted an important database table, and cannot recover the data easily. 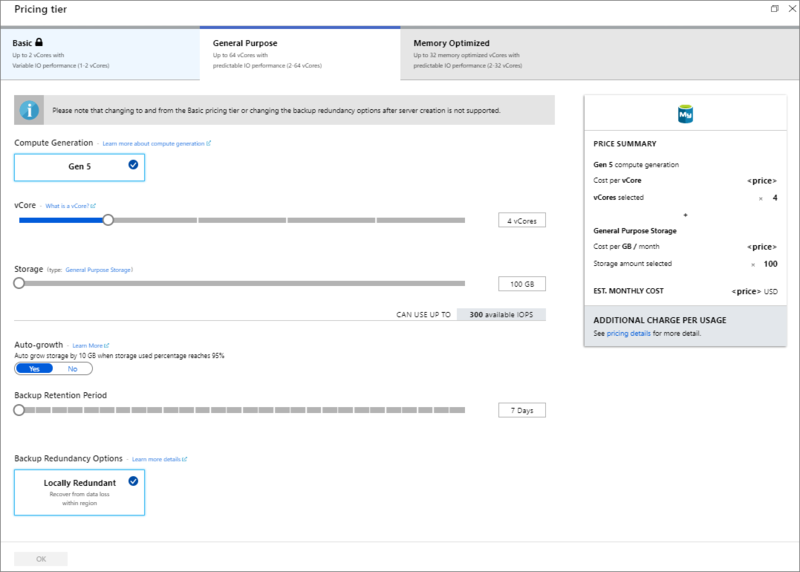 Azure Database for MySQL allows you to restore the server to a point in time, creating a copy of the databases into new server. You can use this new server to recover your deleted data. The following steps restore the sample server to a point before the table was added. In the Azure portal, locate your Azure Database for MySQL. On the Overview page, click Restore on the toolbar. The Restore page opens. Fill out the Restore form with the required information. Restore point: Select a point-in-time that you want to restore to, within the timeframe listed. Make sure to convert your local timezone to UTC. Restore to new server: Provide a new server name you want to restore to. Location: The region is same as the source server, and cannot be changed. Pricing tier: The pricing tier is the same as the source server, and cannot be changed. Click OK to restore the server to restore to a point in time before the table was deleted. Restoring a server creates a new copy of the server, as of the point in time you specify.